The once-popular Rapidshare is out of business, but not to worry, as there are plenty of great alternatives. Find out about our top picks for filesharing and more. 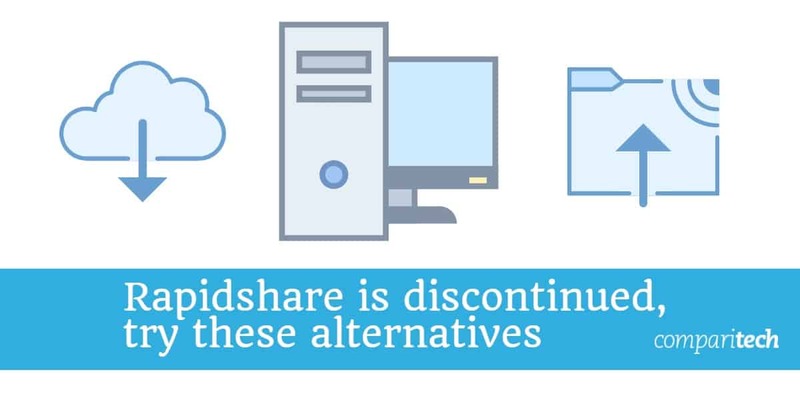 In March 2015, filesharing service Rapidshare shut down operations and deleted all remaining files. Once hugely popular, the company had succumbed to pressure to tighten anti-piracy measures, and as a result lost hordes of customers, forcing it to cease operations entirely. Thankfully, a ton of Rapidshare alternatives are available and filesharing has come a long way in recent years. Plenty of services give you the option to share files quickly and simply and come with a host of other features too. In this post, we reveal our top picks for Rapidshare alternatives and explain why each one might be a good fit for you. These companies all offer filesharing services as their bread and butter, but many have additional features you might be looking for. Dropbox is one of the most well-known names in the filesharing business. With more than 500 million users, there’s plenty of social proof that this service can perform. Dropbox allows for quick and easy filesharing and is ideal for both individual and business use. You can access your Dropbox folders through any web browser or you can download the software onto your most commonly used devices for easy access. Files sync across devices so you don’t have to worry about who has the most up-to-date version. Free plans come with 2 GB of free storage space, syncing, and shared folders and links. Dropbox also provides a new feature called Dropbox Paper, which is similar to Google Docs. Paid plans start at $9.99 per month and include 1 TB of storage along with additional features, such as remote device wipe and offline folders on mobile. There are no free business plans, but there is a free 30-day trial. Prices for business packages — which include at least 3 TB of storage space — start at $12.50 per month per user (minimum of three users) once payments kick in. Volafile offers synchronized filesharing and chat in one platform and is ideal for groups or teams. Users create a “room” in which to store their files, and each is equipped with it’s own chat feature. Your room has a unique URL that you can share with as many people as you want. This service is completely free. You can upload files up to 20 GB in size, but they expire after just two days. This is a great service for study groups or brainstorming sessions, but isn’t a good option if you need any sort of long term storage. Tresorit is a big name in the filesharing business and is known for its top-tier security. It lets you sync and share folders with zero-knowledge encryption, meaning that no one, even within the company itself, knows what you’re sharing. Tresorit stores your files in constantly-guarded EU data centers. Message authentication codes are applied to each file ensuring that, even if the system is hacked into, the files cannot be modified. All these security features come with a pretty hefty price tag. While Tresorit is free for individuals to send files up to 5 GB in size, a no-cost account doesn’t include any data storage and lacks some security features. For 200 GB of storage and additional features such as deleted file restoration, two-factor authentication, and version recovery, prices start at $10.42 per month. 4Shared is different to many others on this list as it also serves as a public file database. Here, you can browse files, including music, video, and book files, as well as apps. You can also upload your own files to the cloud and keep them private or share them publicly. Free plans come with 15 GB of storage space, but the maximum file upload size is 2,048 MB. Paid plans (starting at $6.50 per month) come with 100 GB of storage space and maximum file upload size of 100 GB. A premium plan also gives you ad-free sharing, faster download speeds, SSL data encryption, a recovery option for deleted files, and direct download links, among other features. Zippyshare is an entirely free filesharing service. With no upsell opportunity, this service doesn’t come with a nice shiny interface and is very basic in what it has to offer. That being said, if you just need to quickly upload and share some files, then it does the job. By default, your files will be made public, but you can change the settings to private before you upload. Once you’ve uploaded, you will receive a unique link that you can share with anyone you wish. Zippyshare doesn’t require signup, offers unlimited disk space, and has no download limits. However, the file size limit is small at 500 MB and files can only be stored for up to 30 days with no activity. Moving on to a more sophisticated platform, Mediafire is a user-friendly filesharing service with a lot to offer. Free accounts include up to 10 GB of storage, with a 4 GB maximum file size. You get unlimited bandwidth and downloads and links for sharing your files. Apps allow for bulk file uploading, even thousands at a time, and the file manager makes organization a cinch. One-time links are a neat feature that enable you to send links that can’t be shared with anyone but the primary recipients, ideal if you’re dealing with sensitive files. A Pro account gives you 1 TB of storage and an ad-free experience. It also allows you to embed links directly in your website, emails, or social media posts, so recipients can avoid going through the Mediafire website. Other perks include bulk downloads and direct uploading from website links. The Pro plans start at $3.75 per month. Yandex Disk is solely focused on photos and videos and enables you to store up to 10 GB worth of files for free. Files can be shared with others via short links. A perk is that Yandex gives you free access to Microsoft Office Online (including Word, Excel, and PowerPoint) from within your browser. Yandex Pro is available starting at $2 per month and includes additional storage (100 GB to 1 TB of data depending on the plan), no ads, priority support, and a few other features. Mega is a secure cloud storage service that also allows for filesharing, although not with the ease that many other services offer. It does offer a decent amount of free storage space, which is currently 10 GB per plan, but this seems to be changing regularly. MEGA used to be a very attractive option as it offered users 50 GB of free space. However, in 2018, it changed its model slightly and only offers that space to users who pay a licensing fee or complete tasks such as inviting other users to MEGA. Sync has a large focus on privacy and security. It Includes end-to-end encryption, password protection, expiry dates, and permissions features. As its name suggest, all uploaded files are synced so that you can access updated files in real-time from anywhere with any device. Sync is known for its great in-house support, which is particularly good news for novice users. The free version of Sync gives you 5 GB of storage and basic sharing features. Paid plans come with a 30-day money-back guarantee and start at $49 per year for individuals for 500 GB of storage. Business plans start at $8 per month for 2 TB of storage. Jumpshare is a bit different to many others on this list in that it is primarily focused on providing a sharing platform for creatives. It enables users to view more than 200 file formats, including videos, large documents, and presentations. This service is ideal for people who need to collaborate on visual and audio projects. Perks include capturing and annotating screenshots, recording your screen with audio, and real-time commenting on files. Jumpshare integrates seamlessly with hundreds of apps, including Slack, Trello, and Asana. Free plans include 2 GB of storage, a 250 MB upload size limit, and 30 seconds of screen recording. Starting at $8.25 per month, the lowest tier paid plan (Plus) gives you 1 TB of storage, a 20 GB file upload limit, and unlimited screen recording, among other features. PixelDrain is a completely free service that enables you to quickly share files. You can upload a file up to 5 GB in size and instantly get a sharable link. Uploads are kept for up to 60 days after they were last viewed. The site is currently maintained by just one person, and although it’s free to use, donations are accepted and encouraged. This isn’t a very secure option for filesharing but it is quick and easy. You don’t even need to register for an account and your files will be saved locally in your web browser. Ge.tt is a lot like PixelDrain in concept. It has a super simple interface and is easy to get started with. All you need to do is start dragging and dropping files onto the homepage, and you can share them without even creating an account. Sign up is required to start storing files, and Ge.tt allows up to 2 GB of storage for free. If you opt for a premium account, you can get 50 GB of storage, a 1 GB upload size limit, and a 500 GB daily download limit starting at $1.99 per month. The Premium Plus plan allows 1 TB of storage starting at $3.99 per month. This isn’t a bad option for storing and sharing a small number of files, but it definitely doesn’t have the bells and whistles of many others on this list. Copyright laws: Depending on what you’re sharing and where you reside, there are likely strict laws pertaining to sharing materials that bear a copyright. Make sure you have the right to share or download a particular file before doing so, or you could land yourself in hot water. Malware: Anywhere that files can be uploaded and download publicly can be a convenient place for a cybercriminal to spread malware. Before you download a file, make sure it’s from a trusted source. Public versus private: Some filesharing services give you the option to share files publicly or privately. Make sure you know what settings you’ve checked before sharing, especially if files are of a sensitive nature. Also, take advantage of other controls such as one- time links, password protection, and expiry dates. Encryption: Many filesharing services offer end-to end encryption, but if they don’t or you want an extra layer of security, you might want to consider encrypting your sensitive files before uploading to the cloud. This way, only someone with the decryption key will be able to view the contents of the file.